At once admirable and alienating, Sam Beam’s latest LP under his Iron and Wine moniker is an album that will quite rightly be showered with praise, heralded by critics and fans alike as not just a step forward, but a full-fledged musical triumph. But tragedy of tragedies: The same qualities that make it one of the most technically impressive albums of the year also make it one that many listeners will find to be rather dissatisfying– easy to admire, harder to really love. But first things first: It can’t be stressed enough that, in terms of studio craft, this one’s a masterpiece. Beam and producer Brian Deck have made an Iron and Wine record that’s bigger, bolder, and weirder than anything Beam has ever done. The relatively busy production of Woman King and the full-band arrangements of his Calexico collaboration are nothing compared to The Sheperd’s Dog, a spooky, surreal collection that shimmers with sitars and organs and pianos, steel and slide guitars, motifs borrowed from American, Indian, and African music in almost equal measures. 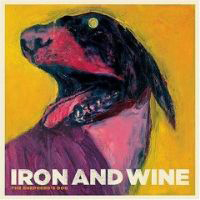 There’s never been an album quite like it, by Iron and Wine or anyone else, and he’s brought with him a batch of suitably bizarre songs to match the production, with creepy apocalyptic imagery and fractured poetry replacing the romantic, confessional nature of records like Our Endless Numbered Days. These are the kind of full-screen, Technicolor productions that Beam’s vivid lyrics have always half-hinted at, and, to his credit, he’s made some smart moves here to retain the intimacy that has long been his trademark. Hand percussion, rather than a full drum kit, gives these songs an organic, communal feel, keeping them rooted at least somewhat in singer-songwriter territory rather than pushing them over into full-band terrain. Critics are already adoring this one, and I completely understand why. But as hard as I’ve tried, I can’t bring myself to share their enthusiasm. There’s a reason that all the reviews are talking about the production rather than the songs themselves. It’s partly because the production is so lavish, but it’s partly because it frequently overshadows the songs themselves. Listen to the album once, twice, even several times and you’ll be sure to remember little textural moments or production choices, but melodies are harder to recall. Each song comes forward with a different production gimmick, and so much stuff clutters the surface of these songs that the depth of the songs themselves is crowded out of the picture. A big part of it is the voice. Sam Beam hasn’t adopted a carnival barker’s voice here, which almost seems to be what the songs are calling for; he’s still singing in that same hushed whisper that he always has, and he’s buried in the mix so far back that his voice is basically just another component of the production. There’s no center to these songs, no human presence that commands our attention; instead, it’s just a long collage of different sounds and noises that keep all our attention on the surface. To say that the whole thing sounds really cool is an understatement, but I can’t shake the notion that this is an album that will quickly wear out its welcome, as the sonic details lose their novelty and there’s not much else to keep our attention. So while it’s a fine record that demands to be heard, I can’t help but wonder whether, sooner or later, listeners will start to suspect that the emperor isn’t wearing any clothes.